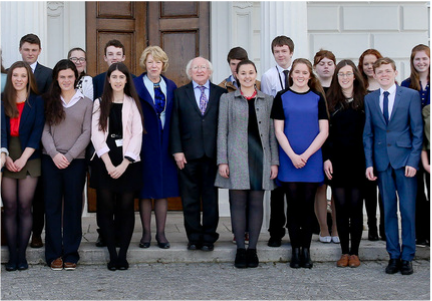 ​The Iveagh Scholars is an internship programme for Transition Year students. It is an opportunity for secondary students to share their views on Ireland’s role in the world, and to get involved in the discussion about how the Department of Foreign Affairs and Trade promotes abroad the values, interests and economic well-being of Ireland and its people. It is aimed at both Transition Year students in Ireland and Year 12 students in Northern Ireland. In February 2015 Kate Hall was selected from hundreds of applicants. Below is Kate's account of her time with the Department of Foreign Affairs. 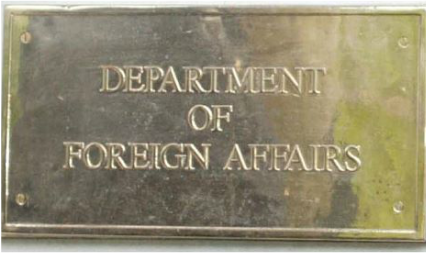 As part of Transition Year in Coláiste Bríde I was given the opportunity to apply for a week long programme in the Department of Foreign Affairs and Trade. This programme was the first of its kind in Ireland and no government department had ever opened its doors to more than one student at a time before. Obviously I jumped at this unique chance and filled out an application which included a 500 word essay based on the title ‘Ireland’s Values’. I don’t think a broader topic could’ve been chosen as the title allowed each student to have their own take on it and as I later found out, all of our entries were vastly different. It was months until we finally got word back about our applications and I was fortunate enough to win a place on this programme. Thus began one of the most amazing experiences of my life. April 27th marked the first day of a packed week, full of incredible opportunities. Naturally, everyone was pretty nervous on the first day so we took part in some prepared ‘ice-breaker’ challenges to get to know each other before meeting with the Secretary General of the department. He explained what his role was and how he came to be in it. One thing we all learned pretty quickly was that there is no specific course required by the department. The people working there had degrees in everything from archaeology to medicine. That afternoon we took part in ‘The Life of a Diplomat: The Good, The Bad and The Ugly’ in which we spoke to Irish diplomats currently stationed in Dublin and around the world. We held a video-conference with diplomats in Chile, Sierra Leone and Vietnam. They all talked about their different experiences within the department and the opportunities it has given them in life. They told us about the positives and negatives involved in the job but all wholeheartedly agreed that it was a job they loved and doubted they could ever leave. One of the diplomats living in Dublin currently, told us that, “You can have a boring day, but you will never have a boring week and you definitely won’t get have boring month. The work is extremely varied and there’s no manual. You have to learn as you go and that’s not always easy.” He talked about the utter chaos in the job where one day you’ll be in a tiny consulate somewhere in the Middle East unblocking a toilet and the next day you could be five feet away from Barack Obama or Ban Ki Moon at a dinner table. The session was extremely interesting and gave us all a great insight into the life of a diplomat. receivers. This role reversal opened up an entirely new perspective about where the aid is actually needed, even if the people receiving the aid may think otherwise at the time. On Tuesday all thirty of us were dropped into various crisis situations abroad and we had to come up with a convincing argument as to why the Irish Embassy in that country should prioritise our case over all the others. Unfortunately, I got dealt a bad hand as my scenario was being caught in a bar with drugs on my person. They were supposedly "planted" on me and that was the case I was supposed to make. However, I was aware that embassies hold no sway with law enforcement abroad and they can't help you unless your rights are somehow not being met. Thinking on my feet I quickly came up with the excuse that the police were holding me for an unlawful amount of time without actually charging me of any crime and that this was a gross miscarriage of justice. My argument must have convinced the judges because the case was prioritised in the top five. After the crises intervention session we were split into groups to organise various aspects of an official press conference. My side of it was in relation to social media, specifically Twitter, as the DFA rely heavily on these popular sites to keep the public up to date with the goings on inside the department. Our task was to live tweet the conference using preprepared tweets. This task proved harder than we originally expected as it's rather difficult to fit a lot of important information into 140 characters or less. For example, the last sentence you read contained 143 characters. As you can see, trying to keep your information as compact yet as informative as possible is no mean feat. The Scholar filling in as Minister Flanagan was given the challenge of delivering a speech to the media and representatives from NGOs about Ireland’s pledge of aid to Syrian refugees. The Iveagh Scholars acting as journalists and members of various NGOs then asked the Minister questions about his announcement as well as some other relevant topics. Despite the interrogatory nature of the questions, the "Minister" handled it very well and the press conference went off without a hitch. On Tuesday afternoon we were once again split up, this time into four different groups. Each group was going to be visiting an embassy in the city. The options were the US embassy, the French embassy, the Brazilian embassy and the Japanese embassy. I was fortunate enough to be placed in the group heading to the Japanese embassy which I was very excited about because obviously, Irish culture is very different than that of Japan. First we went through the standard security procedure, similar to airport security, before receiving a tour of the embassy. We watched a short presentation about Japan and the many differences in our cultures before asking the representative of the embassy about his life and the previous countries he has been stationed in. To finish off the day we watched a short anime film, which is one of Japan’s greatest exports. of Sinn Féin. We got a small tour of his chambers as well as having an informal reception with the Mayor in which he talked about Belfast’s goals for the upcoming years. When this was over we drove to Hazelwood College, an integrated school on one of the peace lines in Belfast. An integrated school means that students can attend regardless of race, religion, or any other factor that could be discriminated against in other schools. Integrated schools in Northern Ireland mainly focus on mixing children of Catholic and Protestant backgrounds, but of course there are students from many different denominations in attendance. Students and staff in the school talked about the differences between Hazelwood and a non-integrated school as well as the benefits of attending an integrated college. One of the points reiterated many times by the students themselves was that this prepared them for the future as when they began university or got a job, there would be no segregation and that might be hard to adapt to if you had known nothing else. After our tour of Hazelwood the group went to the Peace Walls, separating Catholic and Protestant areas. It was sobering to see the strong divide that still existed in a place so close to home. It reminded me of East and West Berlin in a strange way which I had always felt detached from as it was far away in Germany and ended in 1989. But the divide is still very much present in Belfast, the question is if it is necessary or not. The bus brought us to Windsor House where the Irish consulate is based in Belfast. We met with ‘Young Influencers’ of Belfast, a group who are trying to create the Belfast they want to see by 2030 with the help of young people. They have set out targets to reach by 2030 and ways in which they can achieve them. To get our perspective on the matter they got us to take part in an activity they had used on teenagers from Northern Ireland as well. 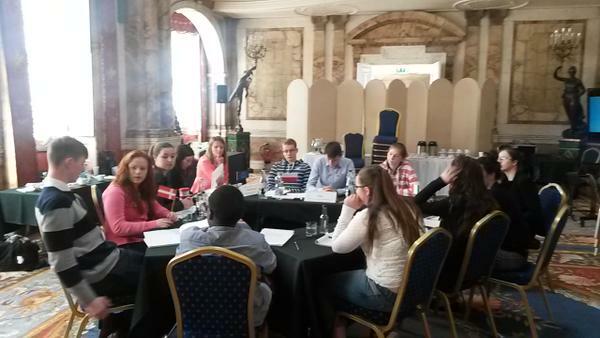 We got into small groups and talked about what our ideal Ireland would look like in 2030. It’s very simple in theory but when actually faced with the challenge, coming up with achievable yet optimistic goals for our country was harder than expected. One thing that struck me was that every group wanted to see a change in our education system and surely that speaks volumes. The very people going through said system don’t think it’s right for the children of Ireland. Before heading back to Dublin we had a talk with an Irish diplomat based in Belfast about the major issues he faces working there. He has to handle them quite sensitively for obvious reasons and try and appear fair and impartial at all times which is not an easy task. However, the consensus was unanimous at the end; Northern Ireland is in a much better place than it was before the Good Friday Agreement. Hopefully someday soon we will see the Peace Walls come down and the divide grow smaller and smaller until Belfast is one city, united. received a small tour before taking our seats and watching the new ambassadors for Egypt, Chile and St. Vincent and the Grenadines hand over their credentials to the President. It was a surreal experience as this is a very private ceremony that few people have ever seen in person, especially members of the public. We then watched the new ambassadors receive their Guards of Honour outside the Áras before individually meeting the President himself. It was more than a little intimidating but he couldn’t have been nicer and he made us all feel at ease. We went back inside Áras an Uachtaráin and had a small reception which was one fo the most unique experiences of my life, I felt extremely out of place. What business did a fifteen year old girl have drinking tea in the President’s house? It was honestly one of the best experiences of my life and all because of a short essay. 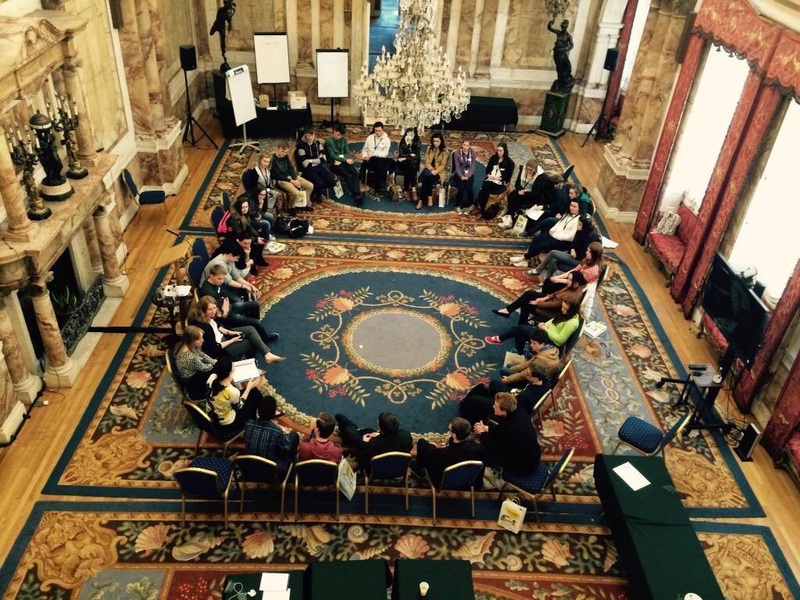 When we got back to Iveagh House we took part in a Human Rights discussion with the people in charge of that section of the Department of Foreign Affairs. Representatives from the IDA, Enterprise Ireland, Tourism Ireland and Bord Bia came into Iveagh House to talk about their roles in relation to the trade part of the department. We were then split into groups and tasked with giving a presentation from the perspective of a particular body. My group was the IDA and we were asked how we would convince a Chinese internet company to choose Ireland as its European base rather than our major competition, Switzerland and the Netherlands. I was chosen as the person to present our work to the board and they would then choose which they were most convinced by. It was a really fun experience but very educational at the same time and it was made even better when my team won. As Friday was the last day Kate, Ellie and Nora, the organisers of Iveagh Scholars, decided to have a really fun activity for us. We were split into three groups and given multi-lateral bodies. My group was the EU and our topic was climate change. We were further split up into countries; Denmark, Poland, Ireland and France. Myself and another Iveagh Scholar were Team Denmark and we had to negotiate with the other countries in order to get the best terms possible agreed on. These negotiations went on for over two hours, which seemed like a long time, but in the actual EU they go on for days. In the end and after much deliberation, everyone was happy with the result. We then had a review of the whole week and what everyone enjoyed or didn’t. It was really interesting to hear the individual opinions on everything as something I might have loved, someone else might have hated. When this was over there was an informal reception held for us in Iveagh House. We got to meet diplomats and ambassadors from all around the world and even talk to the people who had judged our entries to the competition. It was a great way to end the week but of course everyone was sad to say goodbye. improved my confidence, my knowledge and really broadened my view on the world. So next time you have the chance to enter a competition, go for a promotion, go out with friends or even something as simple as singing karaoke in front of a crowd, do it. You feel so much better having taken the chance and maybe you’ll get something amazing out of it. I know I did.